Every pitmaster and backyard grill king needs a quality set of grilling tools. The right tools are essential for handling each cut of smoked or char grilled meat. Grill tool sets are popular gifts this time of year and there's no shortage of options. Nearly every big box store and online retailer offers one or more sets. The key is finding the right tools for your needs. If you've got a large grill and/or often find yourself handling large cuts of meat, Cave Tools may have the grilling set you're looking for. These over-sized, stainless steel tools are designed to do some heavy lifting. Cave Tools' website says that they are produced with 20% more stainless steel than competing grill sets. They are definitely on the heavy side. However, they don't feel quite as stout as the Man Law grill set I reviewed (and currently use at home) two years ago. The extended length of the Cave Tools set is ideal for large grills. The long spatula allows you to reach the back of the grill without getting your hand too close to the flame. It's the type of spatula that I would use when grilling burgers for a crowd. The tongs work well for situating larger cuts on the grill or smoker. They're particularly useful for full racks of ribs. They are, however, cumbersome when trying to handle smaller items. If cooking a large quantity of chicken wings or hot dogs, for example, it takes quite a lot of grip strength and stamina to constantly move and turn the meat. Other features worth noting are the hooked ends making each piece easy to hang from any grill station. The spatula also features a serrated edge for scraping the grill. More importantly, the spatula can be used as a bottle opener ensuring that the pit master stays refreshed as he/she prepares dinner. 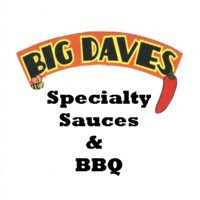 I've used a pretty wide variety of grilling products over the years. These days they come in nearly every size, shape, color and material. While I wasn't blown away with the Cave Tools set, it definitely falls on the higher end of the scale. They're pretty stylish and appear to be well made. I expect they'll hold up well for quite a long time as well. 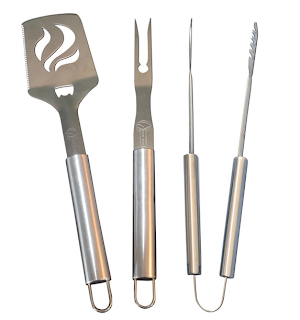 Check out the grill set at http://mycavetools.com/ or you can order your own set through Amazon. 8 Response to "Cave Tools Grilling Set"
There are a few Weber grill tools accessible in kitchen retail locations including, yet not constrained to, the Grill Brush and Scraper, the Black Barbecue Apron, and the FireSpice Hickory Wood Chips. These are for the most part being sold at extremely sensible costs. I find a very good website for the Viking Parts , If you want you can visit this site. The free site for the online free robux for the free robux generation is onlinefreerobux.com/ for the free play of the roblox free robux game to play free. We offer all types of grill sets. You get what you pay for! Having a nice grill set is essential for any professional bbq chef! Beautiful article, Really informative, I really appreciate your useful post.